Look for Blackbeard soon in this classic attraction, and the return of Davy Jones later this year. I just found out that this will in fact be the first time that Blackbeard will be in the Pirates of the Caribbean ride. According to what Disney says, although the previous captain (before Barbossa was added) did have a black beard, he was never supposed to be Captain Blackbeard himself. Why not make quick switches like these available for special events? For example during the Mickey Christmas Party (Say Dec 6th) you could switch the pirate theme for the party. Not only that but if you get rid of Captain EO at Epcot by then it could make a special appearance at the Magic Kingdom for these special events. I am super excited to see the new movie but really bummed to hear that your changing the mist. Seeing Davy Jones is my favorite part of the updated ride. I hope we get a switch up of them so its a little different every time we ride. I know I always go on this ride multiple times when Im at Disney! I like Stephen in post #2 would like to know when the switch back will happen. Personally, I will be going to Walt Disney World in December of this year. I will be attending Mickey’s Christmas Party on Dec 6th for my Birthday and am hoping that I will be able to see this at the Magic Kingdom. Please also have Captain EO stay at Epcot so I can also experience that too for the first time. It always seems like Disney has something new and when I go in December it gets switched back. It will be cool to see Blackbeard in the ride for a while, but again, I’m glad that Davy Jones will return later in the year. Black is Back! Jones has to Go! Very glad to hear Davy Jones will be leaving (even though it is only temporary)! Never cared much for the movie interpretation of the character. He looks more like an alien from Star Wars than a legend of pirates. 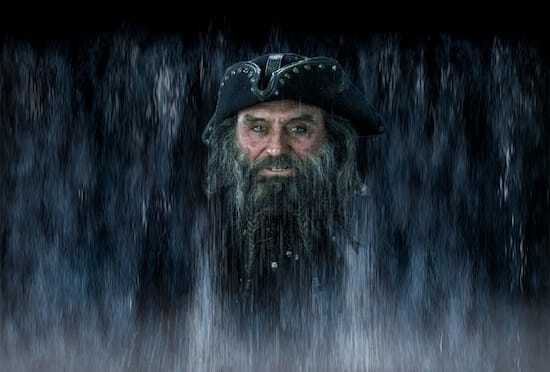 I’m looking forward to seeing Blackbeard on the waterfall, but I do like Davy Jones on the waterfall as well. I would prefer that they switch out Blackbeard and Davy Jones every other fade. OMG. I can’t wait for the new POTC. Taking My daughter to WDW the week prior to the premiere. Gonna round off the trip with going to the premiere in costume once we return home. I can’t wait. It’s awesome! Tom did a great job! Blackbeard in Pirates of the Caribbean, how cool is this !?! So awesome! Yo Ho Yo Ho, hoist the colors! From what I’ve seen of the new movie, there seems to be a bit of a supernatural element to Blackbeard, so hopefully its not too much of a stretch! It will be an interesting addition, and I’m looking forward to seeing something new. That said, I’m also glad that Davy Jones will be returning. Given his water-bound nature, it makes a bit more sense for Jones’ image to appear from the waterfall. Blackbeard seems to be a little out of place as far as story/continuity, but lets see how it goes! Its really cool that they are able to do this for the ride in honor of the new movie. I LOVE the Davy Jones effect and it will be cool to see Blackbeard in there for a while. 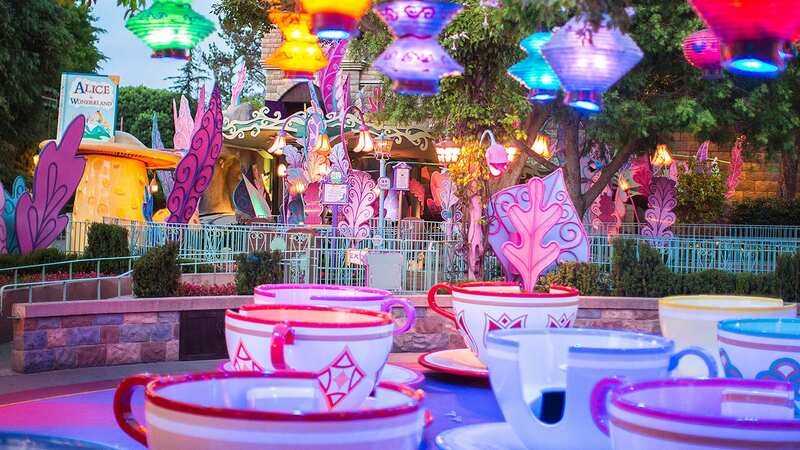 Its always great when Disneyland gives some of its attractions a breath of fresh air every now and then. It’s so neat that attractions are now able to switch content in such a fast way. Cheers to the future! I also agree with Jason about those lines, but the visual effect itself is really cool. Looking forward to seeing Blackbeard next trip! Its my understanding from this post that the image of Blackbeard will be put into the ride starting on May 20th, and will remain there for quite some time (I would assume that it would remain through summer at least) and then Davy Jones will return later in the year. In the Disneyland ride, there also audio of Davy Jones as the boats go up the lift. Will that remain? You will hear Blackbeard’s voice on the up ramp at the end of the attraction. Very exciting to see! Can’t wait to see the change! And yes, guys this is temporary it says, “Look for Blackbeard soon in this classic attraction, and the return of Davy Jones later this year.” which means he will be back! I agree with Jason! And I’m confused too. Is this only a temporary change? This is confusing. Is this temporary? Does it only appear on May 20th, or just for the summer, or forever? Does Davy Jones then replace him again, or will Davy Jones show up in some new place in the ride? I’m going to WDW in October, will he still be there then? Very much looking forward to his being added to the ride hopefully in some permanent fashion. Anything that takes out that line that is wrong dead men do tell tales is a welcome edition. The Davey Jones effect is very cool and blends in well, as the talking skull always made references to Davey Jones, so I’m glad that Blackbeard’s presence will only be temporary. does that mean no more Davy Jones? Or will they swap them out?